I attended the session with Coreworx, an early adopter of Eloqua 10. They are raving about Eloqua 10. During their presentation they set up a simple webinar campaign on the fly. That was very intuitive. Also, the application was very fast and responsive (they used the beta 2). One of the time-saving features that is the type-ahead search: see the video tour of Eloqua 10 for details. The bigger story at the event was the introduction of Revenue Performance Management. Eloqua’s definition is a mouthful: “RPM is a systematic approach to identifying the drivers and impediments to revenue, rigorously measuring them, and then pulling the economic levers that will optimize top line growth”. In short, it is about understanding how marketing and sales drive revenue. It highlights the transition to a more metrics-driven way to optimize sales & marketing for revenue growth. Eloqua has more information about this in a blog post. Jeremy Victor has a nice write-up of the 16 sales and marketing reports that measure revenue performance. Eloqua hopes that these metrics will become a standard, so that they can also be used for benchmarking. By the way: see also Jeremy’s summary of the second day of the conference. In Monday’s blog post I emphasized that process and best practices are they key to unlocking the full potential of Marketing Automation. Eloqua recognizes this and has launched their Eloqua University (including Twitter handle @EloquaU). The courses will focus both on functional topics such as multi-channel campaigns or lead scoring, as well as more strategic Revenue Lifecycle courses. Certification is also part of the University. More at the Eloqua University website. Eloqua is also taking a lesson from Salesforce.com’s playbook by making it easier to extend Eloqua with 3rd party applications. 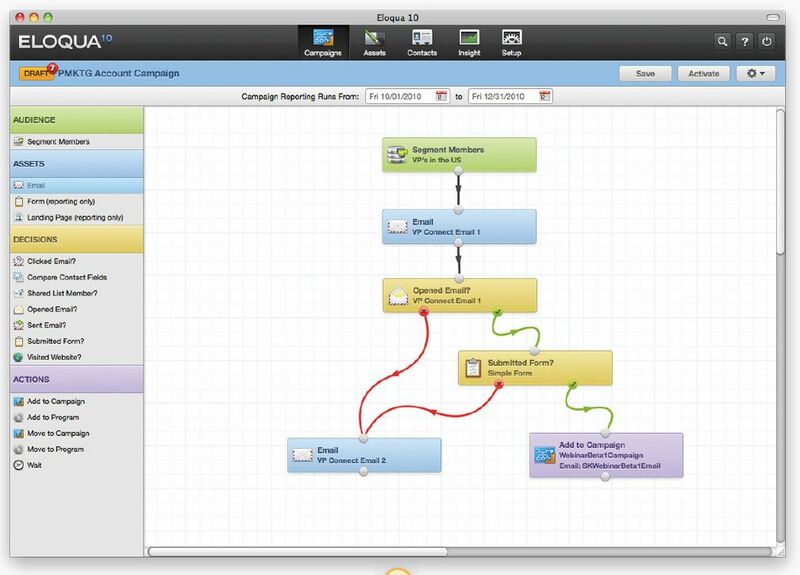 The Eloqua API (application programming interface) has been available for a long time already, but there was no easy way for campaign managers to incorporate 3rd party applications in their marketing programs. The new Eloqua Cloud Connector product integrates 3rd party applications like JigSaw and Webex in the Program Builder. For example, if you want to validate a contacts’s details with the Jigsaw database, you can simply drag the “check data” action into your program and double-click to configure it. There is no “AppExchange” for Eloqua extensions yet, but I wouldn’t be surprised if they’re planning that already. 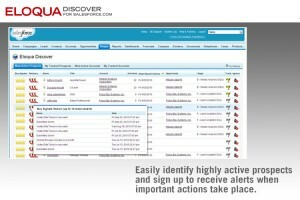 Another new product is Eloqua Discover for Salesforce.com. It is an easy to understand, prioritized view of the hottest, most engaged prospects and accounts. 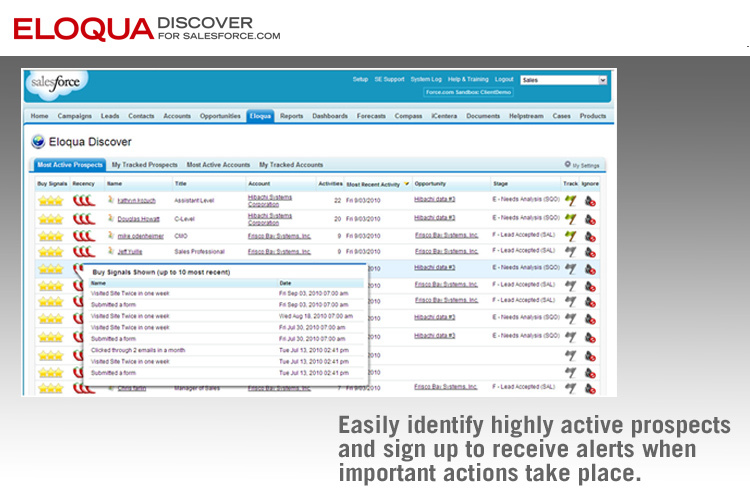 This is available from within Salesforce.com, and it is a native Force.com application available from the AppExchange. So there were lots of new initiatives, products and services that were covered during the event. Also, I was impressed with the large number of presentations by clients. Eloqua clearly has a very active user base, and they’re willing to share their experiences. Please let me know if you have any questions, suggestion or remarks: just leave a comment! Please consider sharing this post via the buttons on the left. Or subscribe via RSS or subscribe via email. This entry was posted in marketing automation and tagged eloqua, event, marketing performance management on October 20, 2010 by Jep Castelein. Great summary Jep! Thanks for sharing. I had a great time at the event as well. I really enjoyed NetApps and their presentation on creating a nurturing program from start to finish. Hi Rob, yes, I was lucky to catch that session too. I liked how Erin used a cooking analogy to campaigns. For example: you need the ingredients (emails, landing pages, forms, segments) before you can prepare the recipe. Very useful presentation. Looks like someone is finally giving Marketo a run for their money. Congrats to Eloqua. Check me out live on HubSpot.TV on 11/19 at 4pm ET. Thanks Jep. Great meeting you at the Marketo dinner at the Sherpa B2B Summit a few weeks ago. From this it seems Eloqua is on the right track, especially compared to previous versions of the platform. Their app now appears EXTREMELY similar to Marketo though. No doubt that is the intent. Should be a win for existing Eloqua customers.